Milbridge Elementary students Spencer Bickford, left, and CJ Lovejoy, right, carry a chair that a new mental health counselor for the school will use. The counselor began visits in January as part of a new program that seeks to improve rural education with research-based strategies to meet students' basic needs. Editor’s note: This is a continuation of an ongoing series, Your School, that examines what is holding back teachers, principals, parents and communities from helping students realize their full potential, and aims to hold up promising efforts that other places might learn from. Each of them took a side and lifted. From the back of a minivan, Milbridge Elementary School students Spencer Bickford and CJ Lovejoy carried an armchair into the school’s art room one day in November. They hauled it to the corner where a mental health counselor was soon to set up shop each week. The counselor is one part of a new program that aims to improve the odds for students in this rural, coastal town and two others in Washington County, which jockeys for the title of Maine’s poorest. The program isn’t just about poverty or drug addiction or hunger or special education or student performance or life expectancy. It’s about all of it. It’s about all the ways families and children in the area may fall on tough times, the trauma that causes, and the ways a school of 115 students can help kids overcome that trauma and learn. It starts with asking, “What are kids coming to school with besides just their backpacks?” said Laura Thomas, a former Milbridge Elementary teacher who started in August as a coach for Cobscook Community Learning Center’s Transforming Rural Experience in Education program, or TREE. TREE resource coach Laura Thomas speaks with Milbridge Elementary student Cody Leighton. Students at the school will conduct a school climate survey in February, to find where students think the school can improve. Backed by brain science, around $1.3 million in foundation money and a team of education researchers at Colby College and the University of Maine, TREE plans to make elementary schools in Milbridge, Jonesport and Charlotte rural proving grounds for methods of addressing trauma and stress that can alter a child’s brain chemistry and hinder learning. It’s a growing movement, stemming from a Centers for Disease Control study that laid the groundwork for research into the toll adverse childhood experiences, or ACEs, take on health and brain development. 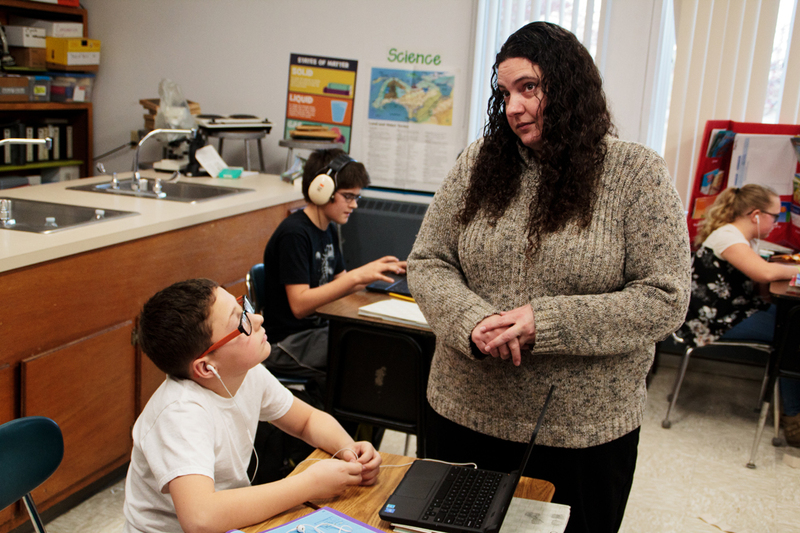 The nonprofit Cobscook Community Learning Center in Trescott hopes to raise a total of $3.5 million to pay for direct counseling for students and training for teachers so they’re equipped to deal with challenges in their students’ lives that interfere with academics. CCLC wants to make the case that rural students can benefit when mental health and childhood trauma experts are regular school budget items. When ACEs experts talk about trauma, they’re not just talking about poverty, but a range of childhood experiences that can lead to frequent, toxic stress. Those experiences include surviving or witnessing verbal or sexual abuse, going through periods of hunger, and having parents separate or divorce. That early trauma elevates the risk of health conditions later in life such as heart disease and obesity, and even raises the risk of suicide. It also has short-term consequences. Maine high school students who reported at least three types of adverse childhood experiences were more likely than peers with less trauma in their past to have experienced prolonged periods of depression, considered suicide, smoked cigarettes and consumed alcohol, according to the 2017 Maine Integrated Youth Health Survey. Some 31 percent of Washington County students recorded at least three adverse childhood experiences, according to the survey, the second highest rate among the state’s 16 counties. The ACEs research continues to change the fields of social work and medicine. More recently, it’s begun to influence classrooms around Maine, where TREE Director Brittany Ray says the awareness is sorely needed. After more than two decades as a teacher and guidance counselor up the road at her alma mater, Narraguagus High School, which serves students from Milbridge, she presents that mission as a teacher would, with open questions and many more rhetorical ones. “When we think about all the challenges we’re having in education, how much of it goes back to ACEs and never having done anything that addresses that in schools?” Ray said. Brittany Ray, TREE’s director, has family that goes back generations in Milbridge. Her grandfather was a janitor at Milbridge Elementary School, which she also attended. This month, mental health counselors began weekly visits to Milbridge and Jonesport elementary schools, with the help of TREE funding. Without counseling sessions at school, students would have to travel hours roundtrip to reach services in Bangor or Ellsworth. The counselors are among the first visible signs of TREE’s impact in its three pilot schools. The program also has full-time coaches lined up at the three schools, to help colleagues respond to student trauma in ways that go beyond just trying to stop bad behavior. Occasional training sessions for teachers will cover the science of how stress and trauma change a child’s brain chemistry. Ray said learning that science caused her to rethink her own judgments about how students may not be entirely responsible for some undesirable behaviors, such as sleeping in class. The trainings aim to change the mindset of teachers in those situations, Ray said, not just provide them a list of new strategies to try when a student acts up. School staff members will also get weekly lessons in teaching a curriculum called Second Step, which has been used in Boston Public Schools and elsewhere to teach students skills outside of an academic lesson plan, such as managing anger and disappointment, and establishing fair ways to play with others. 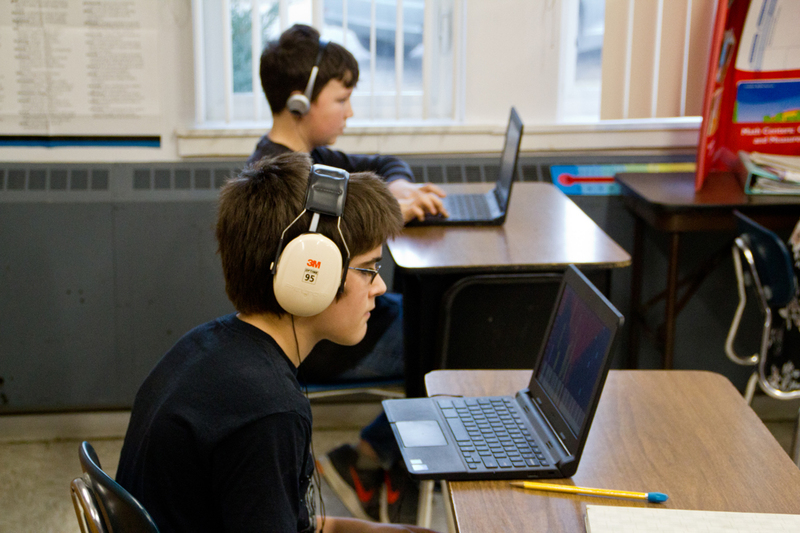 Research has shown those skills can help reduce bullying and improve academic performance. The counselors making weekly visits at Milbridge and Jonesport were booked up in their first week, with eight students a day and an hour to consult with teachers, too. Already, Ray is faced with the question of whether it’s enough. While the TREE program has specific plans for changing teaching methods and mental health support in its schools, it’s also adapting to fill in other cracks it sees as essential to make sure students are ready to learn. That recently grew to giving students a lift to a free dental clinic in Machias in April. In past years, Ray said, students identified as needing additional dental care have gone without it because they didn’t have a way to get there. Ray said that’s a basic need she didn’t see TREE meeting until a conversation earlier this month. CCLC has the vans and TREE has the connections. That kind of adaptation is built into the program’s approach in the classroom, too. 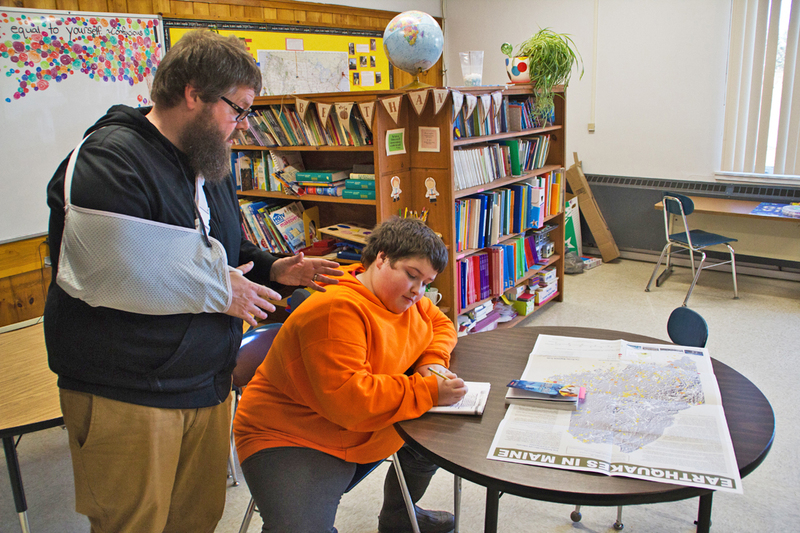 Milbridge Elementary School teacher Don Parker guides Jason Burgess through an assignment. Parker also coaches the school’s girls’ basketball team. In some cases, it’s as small as just letting a student keep a hood on. In other cases, it’s understanding why a student might be distracted, or yawning in class. “Maybe they’ve gotten up and put in a full day of work before they’ve come to school,” Parker said. In all cases, Thomas said, it’s about trying to better understand a student’s behavior before trying to shut it down. Eventually, Thomas said she hopes students will recognize when they’re not ready to learn in class and find a way to hit reset, perhaps by taking a break to talk with a trusted mentor in the school. The Maine Integrated Youth Health Survey results showed that students who had many adverse childhood experiences in their past, but had strong support from adults and felt their school “cares about kids,” were less likely than similar students without that support to contemplate suicide and smoke. Like many schools around the state, Milbridge Elementary has already adapted to meet other student needs. It runs a food pantry and makes snacks available in classrooms. It also has a closet full of winter clothing. Building resilience to trauma further changes the role and expectations of school, a sometimes difficult shift as teachers and others more deliberately consider students’ lives outside the classroom. Ray said the change has led to some early resistance from parents who say their children haven’t experienced such trauma and question its relevance. For teachers skeptical of the methods TREE’s adopted, she throws the question right back. “If what you’re doing right now is working, don’t even bother to think about changing,” Ray said. Parker said he sees the trainings on trauma and strategies to deal with it in the classroom as new tools for approaching old problems. “Anything that we can have in our back pocket to help that trauma piece is invaluable,” Parker said. Ray’s roots in Milbridge go back generations. Her great-grandfather founded the sardine cannery L. Ray Packing Co., where Ray eventually spent summers stuffing chili peppers beneath the small fish. “You dip your hands in soybean oil to coat them so the pepper doesn’t burn,” she said. One thing used to puzzle her about that. The soybean oil sat in a large, emptied can of chili peppers, so dipping her hands in to prevent the burning didn’t work so well. Just as soybean oil surrounded by chili residue isn’t ideal, great classroom instruction won’t be as effective if students are distracted by hunger or fatigue or troubles at home. Those are burns that linger, but experts say they can be overcome. Mackey Andrews, whose group for years has led ACEs trainings around the state for teachers and other professionals, including TREE, said the research is becoming better known but is still not commonplace. And the far-reaching health and social problems ACEs pose, she said, are greater than what schools alone can handle. 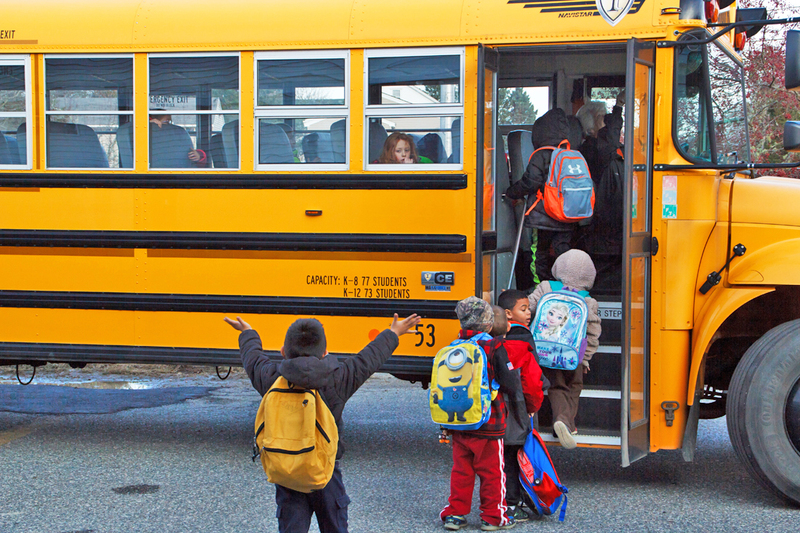 Students board the bus after school at Milbridge Elementary School. The vision for TREE traces back to the aftermath of the terrorist attacks of Sept. 11, 2001, when New York City schools brought in psychiatrist Dr. Pamela Cantor to help students deal with that trauma. What she found was the day-to-day trauma of living in some of the city’s most impoverished neighborhoods weighed more heavily on the students than the trauma of the attacks. Out of that, she built a model of education reform through her nonprofit Turnaround for Children, which touts improved student performance, lower suspensions and disciplinary action and ready access to mental health care at schools in New York City and New Jersey. In Washington County, Cobscook Community Learning Center founder Alan Furth said he thinks a modified Turnaround approach will lead to some of the same changes, cutting the share of students who regularly miss school, improving academic performance and reducing student referrals to special education. TREE is distinct for bringing that approach to a rural area, according to Lyn Mikel Brown, an education professor at Colby College and member of the program’s research team. The rural CCLC did, however, have access to big city ideas. Furth knew Cantor’s brother, University of Maine education professor Richard Ackerman, and the connection led to a call in 2012 that set TREE in motion. CLLC hired Ray in July 2016. “I do think that a person like Brittany is going to have to drive this in any community,” Furth said. Furth said he thinks TREE’s grounding in research and Ray’s local roots make it different. Ray graduated from Colby College and returned to teach at Narraguagus High School in 1995. 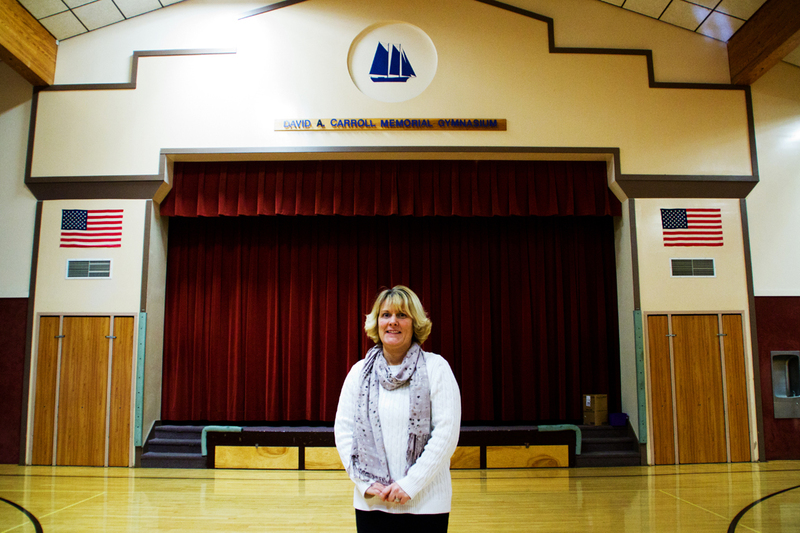 In 2007, she was the first Maine Teacher of the Year from Washington County in 25 years. Shortly after, her fame ballooned when her family was featured on an episode of “Extreme Home Makeover.” All those years led to connections with parents such as Amanda Seavey, whom Ray had as a student. Seavey said her son, now a student at Milbridge Elementary, has a few behavior disorders she’s confident TREE can help his teachers address. The confidence comes from trust in her former teacher. “[Ray] knows that this is going to be a helpful program for my son, and I trust her with it,” Seavey said outside the school on a late November afternoon. Ray has those kinds of connections throughout her hometown. 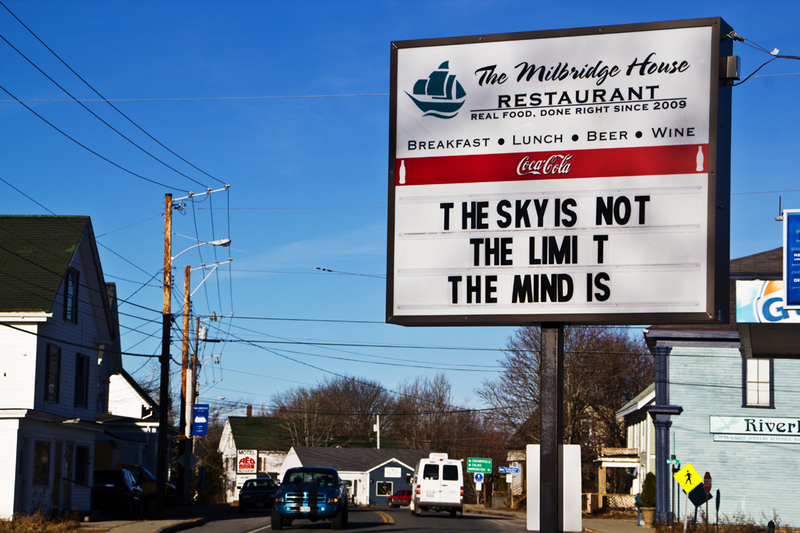 During a conversation with a reporter at the Milbridge House restaurant, Ray chatted with the waitress, another former student. Restaurant owners Kristen and John Naberrete, who have a daughter at Milbridge Elementary, said they think TREE could help address student behavioral problems. “Maybe there’s a trigger that teachers aren’t seeing,” Kristen Naberrete said. 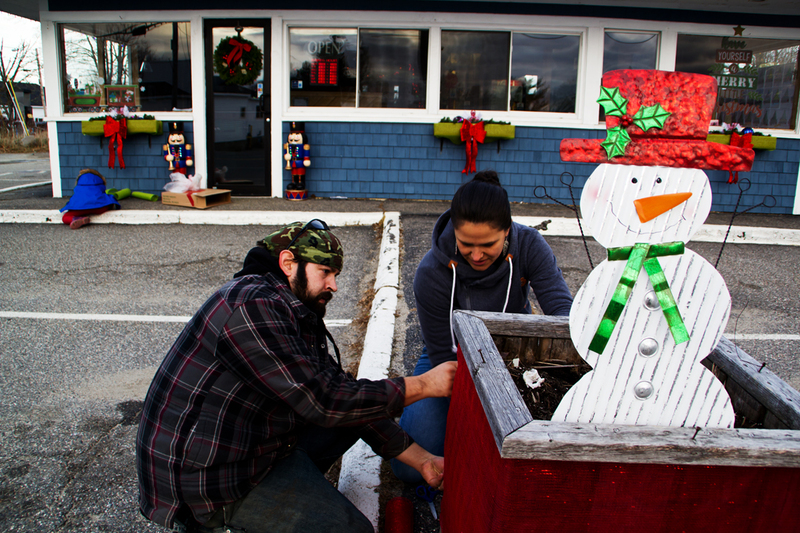 Milbridge House Restaurant owners John and Kristen Naberrete adorn their business for a Christmas decoration contest. Their daughter Lily, a student at Milbridge Elementary, left, plays near the restaurant. TREE’s leaders have a five-year vision for the program and a hope that it will improve school climate, which could mean declines in disciplinary incidents and reductions in chronic absenteeism. The pilot schools are outliers in the latter. About 28 percent of students at the three schools missed at least 10 days of school in the 2014-15 school year, compared with 15 percent nationwide. And part of the long-term vision relies on showing that better mental health counseling and a teaching coach who specializes in ways of developing resilience to childhood trauma can help schools respond to behavioral problems that would otherwise get a student referred to special education. Ray said providing a mental health counselor and teaching coach would cost schools roughly $100,000 a year without TREE’s help. Furth expects schools could recover all or most of that cost through a reduction in special education spending, which has been the fastest growing portion of education spending statewide in recent years. Some of the counseling services could be covered by students’ health insurance or MaineCare. Ray, a parent of two children with autism, said she suspects that teachers are making referrals to special education to address behavioral problems that really have their roots elsewhere. “Our hunch is that many of the students that are identified as special education really have a trauma background,” Ray said. In the coming weeks, the program will lay the groundwork for its long-term vision by surveying students on their impressions of school and how it could improve. Zachary Minkiewicz, front, and Manny Absalom said they’d like to have more time for recess. Absalom said he thinks more time outside would make students less “moody” when they reenter the classroom. Ray said the school plans to make those “Someday” wishes happen, at random, which she hopes might also boost a students’ interest in coming to school to see if their day has come. Some responses surprised her. One student asked to spend a day helping to teach a kindergarten class. Another wanted someone to teach their class new dances. Another sought only to sit in the principal’s chair and eat M&Ms.